Messages is a new app coming this summer as part of OS X Mountain Lion (10.8). Until then, you can download a free beta version of the program that will run in OS X Lion (10.7). The new software replaces iChat (it deletes iChat as part of the installation). Don’t worry about losing iChat; Messages essentially duplicates all of its features. In addition, Messages on the Mac adds a major new feature: it works with the Messages iOS app, syncing with the iOS version so that messages sent or received on any one device can show up on all devices. iPhone Messages don’t sync to Messages Beta. The symptom: You send a message to a friend from your iPhone (running iOS 5), but it never makes it to your Mac version of Messages. There are several potential fixes. As covered in an Apple Support Communities thread, first make sure that you have a single entry for your friend in your Address Book/Contacts database. Assuming you have a phone number and an email address for this person, make sure that both are listed in the same entry. Your iPhone looks first for a phone number to identify the person, while your Mac looks for an email address. If one of these items is missing from the entry, or they are in separate entries, the iOS and Mac versions of the software may not coordinate. Before and after signing in with your Apple ID in the Received At settings for Messages on an iPhone (personal data has been whited out). 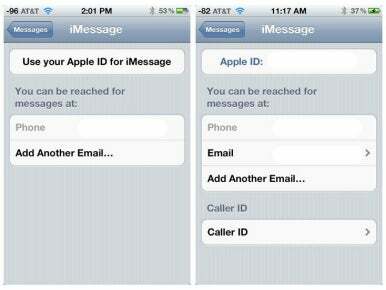 You should now have two message destinations listed: Your phone number and your Apple ID email address. Next, tap the Caller ID item at the bottom of the display. From the screen that appears, select your email address for Caller ID. This should be the same Apple ID address that you use for messages in the Messages Beta on your Mac. If so, iMessages sent from an iPhone should now show up in Messages Beta on the Mac. After modifying Messages’ settings on my wife’s iPhone, as just described, the problem was solved. Message sent! Even after doing all of this, you may still have some problems, such as when a person sends you a message from their iPhone to your iPhone using your phone number as the ID. Such messages will be synced successfully between the two iPhones, but will likely not make it to your Mac. An error in Messages Beta that can be remedied by changing the settings on the receiver’s iPhone. A helpful Mac Observer article goes through many of these permutations in more detail. If all of this sounds a bit confusing, that’s because it is. Although some of the problems are not so much bugs as inherent complications, I still hope Apple will find a way to untangle this by the time Mountain Lion is released. No messages sent from Mac. If Messages Beta on your Mac fails to send any messages at all, try adding 8.8.8.8 as a DNS setting (this is Google’s public DNS). To do so, go to the Network System Preferences pane and select Advanced from the active Network option. From here, select the DNS tab and click the Plus (+) icon to add the new DNS. I’m not quite sure why this solves the issue but numerous users have reported success with it. In any case, I expect this is a bug that Apple will fix prior to the release version. Messages crashes and other problems. Several users have reported constant crashes whenever launching Messages. Other users have been unable to successfully use their Apple ID to sign in to Messages Beta. You’ll find these, and other symptoms, covered in the Messages Beta section of Apple Support Communities. Most of these symptoms affect only a minority of users and have no clear solution. Fixing them will likely require an update from Apple. If any of these symptoms plague you to the point that you want to give up on Messages for now, you can do so. Just select “Uninstall Messages Beta…” from Messages’ Application menu. Messages will be removed and iChat reinstalled. If Messages crashes before you can accomplish this, try reinstalling Messages, launching the app immediately thereafter, and selecting the Uninstall option. It should work. As for me, after fixing some initial glitches, I’ve successfully used Messages Beta numerous times. It works well. Maybe I’m just lucky. Reflection is a new Mac application that does something I’ve been hoping to see for the past several years: It allows you to mirror an iPhone or iPad to your Mac, wirelessly and without needing to jailbreak your iOS device. At last! Now when I am giving a talk at a users group or whatever, I can easily demo what’s on my iPad or iPhone via the same connection I use to project my laptop’s display to the big screen. The software works via Apple’s AirPlay. It currently only works with an iPhone 4S or iPad 2 (and presumably the soon-to-arrive iPad 3). Although there are still a few “version 1.0” kinks to be worked out, the mirroring has worked very well in my testing. However, I did face one significant obstacle when I first tried to use Reflection. After selecting my Mac from the AirPlay menu on my iPad, nothing happened. No mirror window opened up on my Mac. Nada. I soon figured out the reason: I was running another app on my Mac that was already connecting via AirPlay: AirServer. The AirServer app was in my Login Items list, so it automatically launched at startup. Apparently, this was blocking Reflection from connecting via AirPlay. The solution seemed simple enough: quit AirServer. Doing so turned out to be not so simple, as AirServer is a windowless menu-less app with no Quit command. One solution is to remove the app from your Login Items list and re-login to your account. Alternatively, assuming you no longer care to use AirServer, you can uninstall the app via a script provided on AirServer’s website. I chose the latter option. After that, Reflection worked exactly as expected. If this problem popped up because you were switching from AirServer to Reflection to get the mirroring option, you may no longer need to make the switch. An AirServer update adds mirroring support.